database and possible study center. 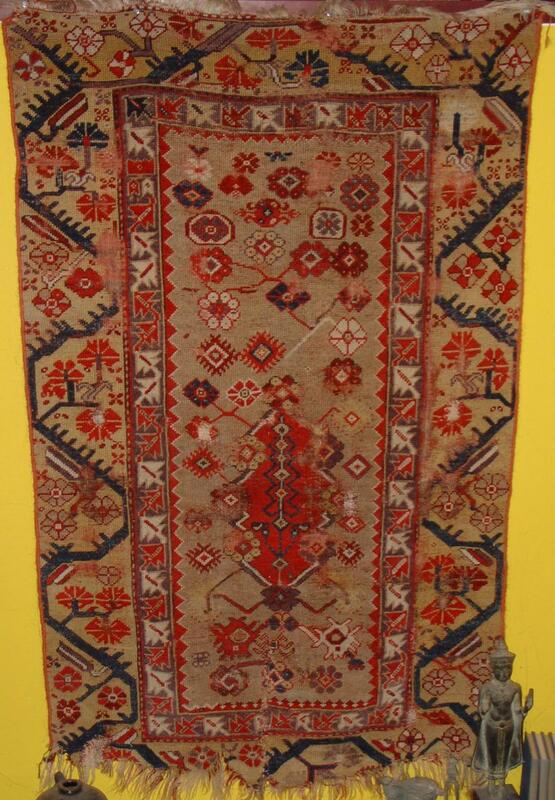 This series of Turkish prayer rugs is part of a significantly larger collection, not currently on display, of Turkish and Caucasian prayer rugs. 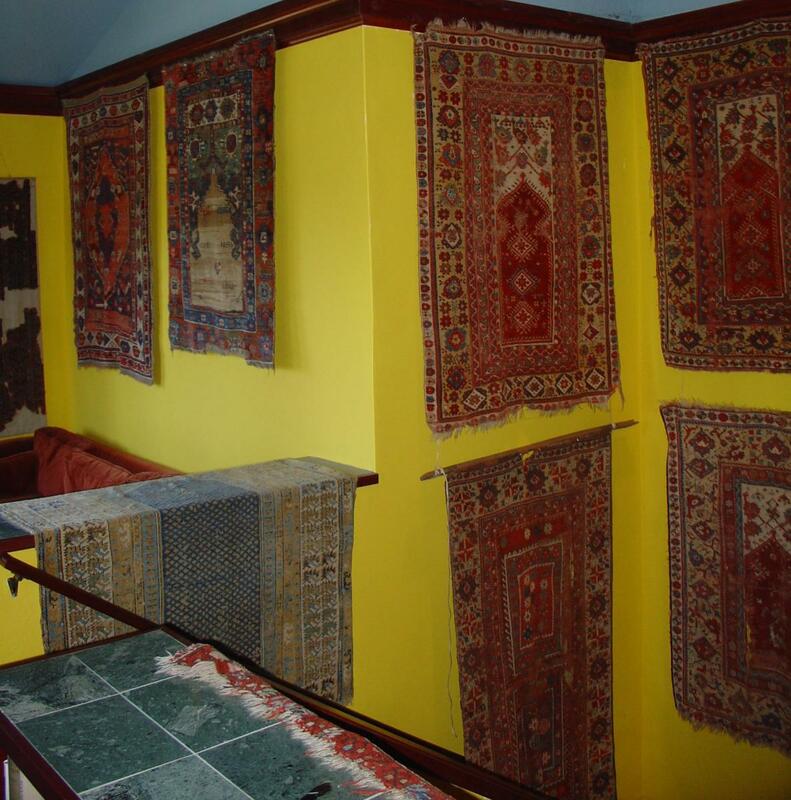 We apologize for the quality of some of the images as the rugs were photographed in situ at Jim Dixon’s Occidental home. 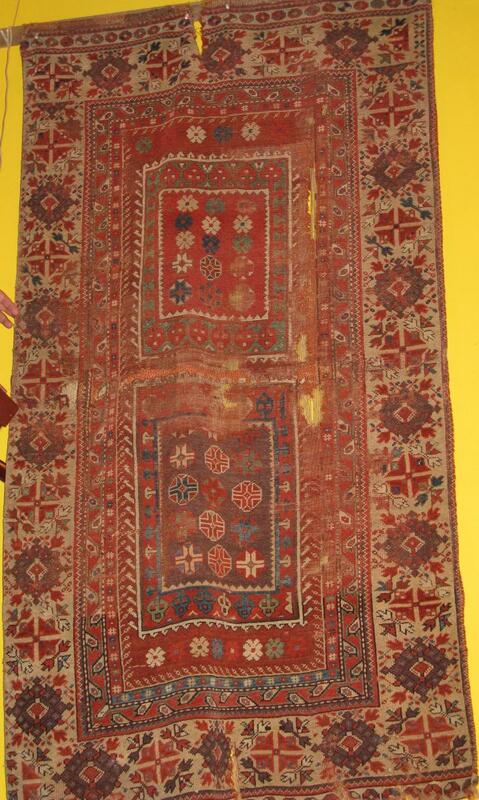 1) 18th century (possibly mid) Mudjur red-field prayer rug with ewers. variations in the minor borders. A remarkably similar example is in the Ballard Collection. 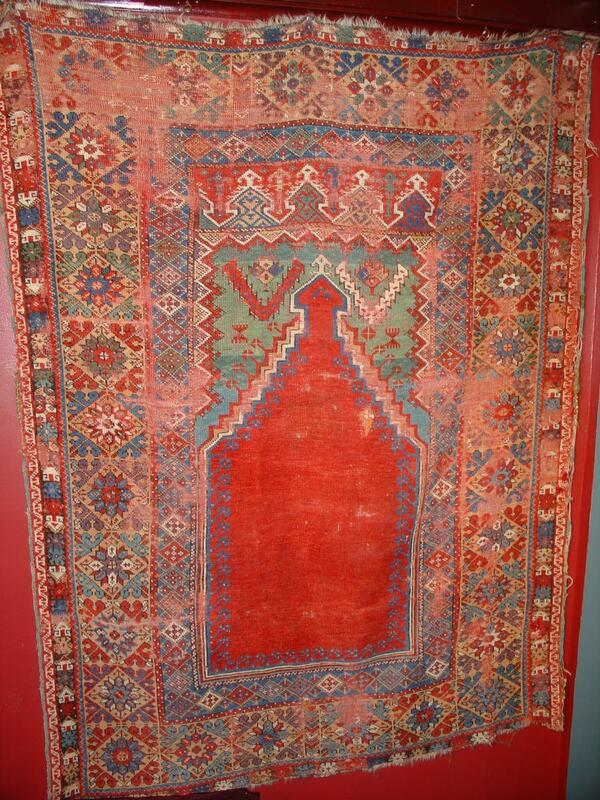 3) Red field Mudjur prayer rug. Late 18th / early 19th century with multi-colored ‘tree of life’. Note the vibrational impact of the of the unusually colored panel above the niche. 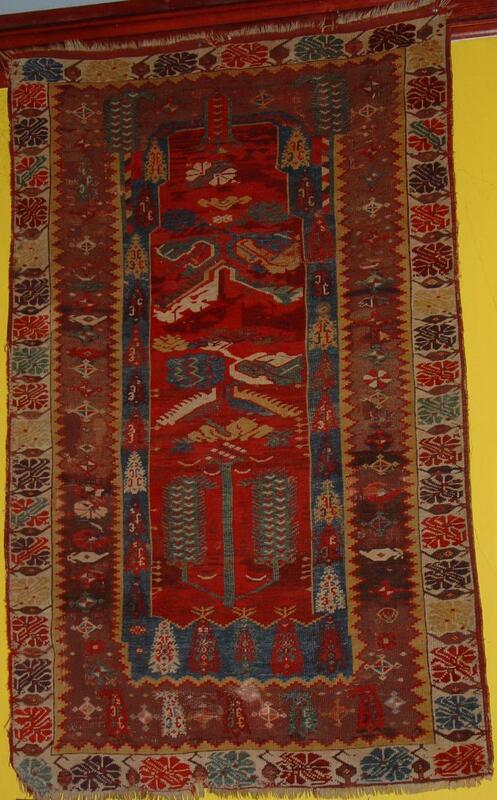 4) 18th century Mudjur / Konya prayer rug with tree of life and ewers. This is the only variation of the standard style border of this design that I have seen. Clearly it relates more commonly to Kirshehir design. The minor borders demonstrate a drawing more commonly seen in Konya pieces as does the weave. It is interesting to observe that the niche of the mihrab thrusts into the inner border of the field. 5) Red field Mudjur? 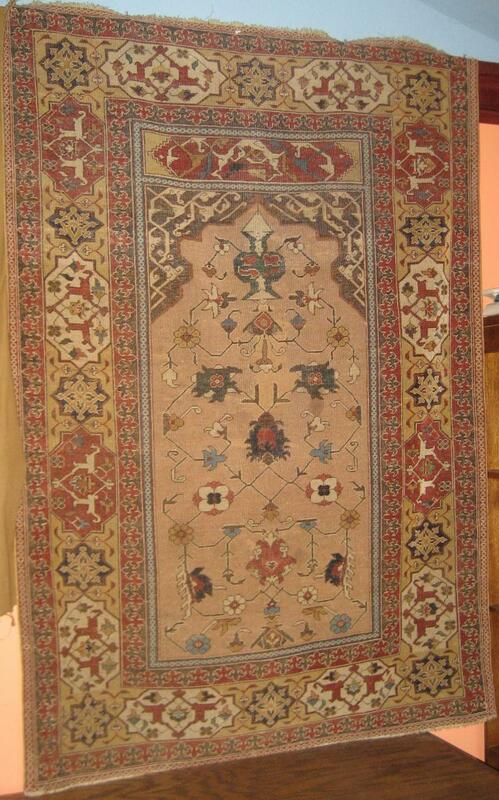 prayer rug with saz leaves and harlequins. 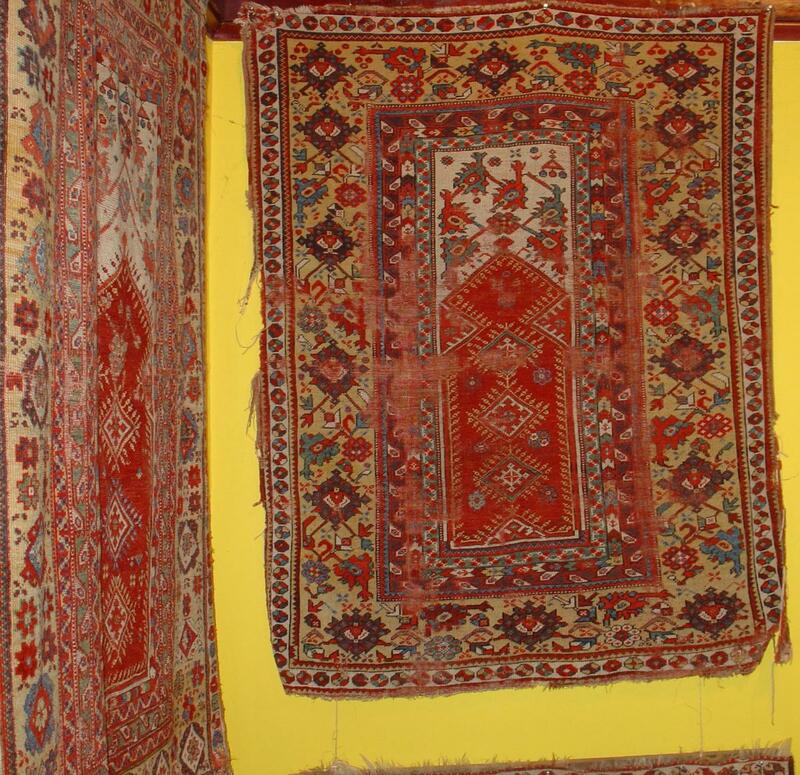 This rug,the smallest in the group, belongs to the rather rare black-wefted group. 7) Red field Mudjur runner, 18th century or earlier? I know of no analogue for it. Typical Mudjur weave, colors and wool. 8) Ochre field Transylvanian (possibly Melas style?) prayer rug. 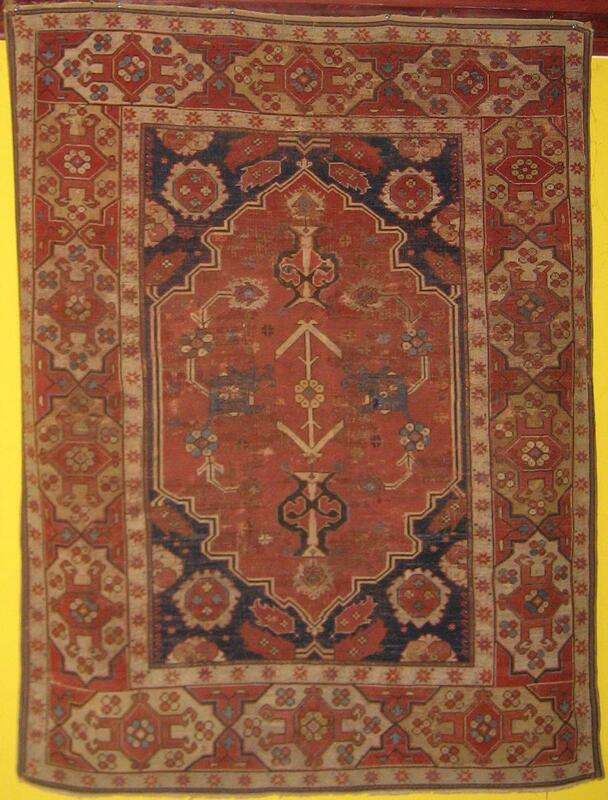 This rug illustrates a design of the earliest and rarest group of the so-called Transylvanians. The edges have been re-woven. There is evident re-knotting and, like the several known examples in Transylvanian churches, there are no lazy lines. While questions have been raised about the authenticity of this piece, this is not a typical Tuduc product. 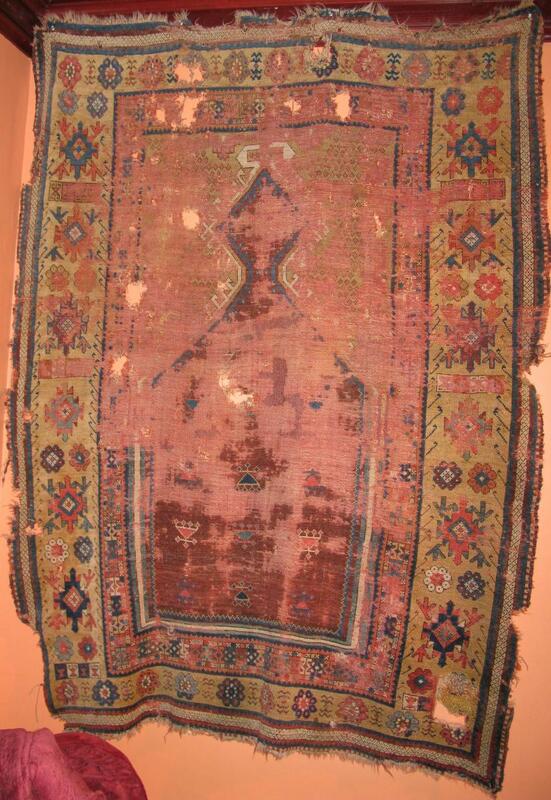 It may be a much repaired early rug or, more unlikely, from some other forger. 9) Tan open field Melas? 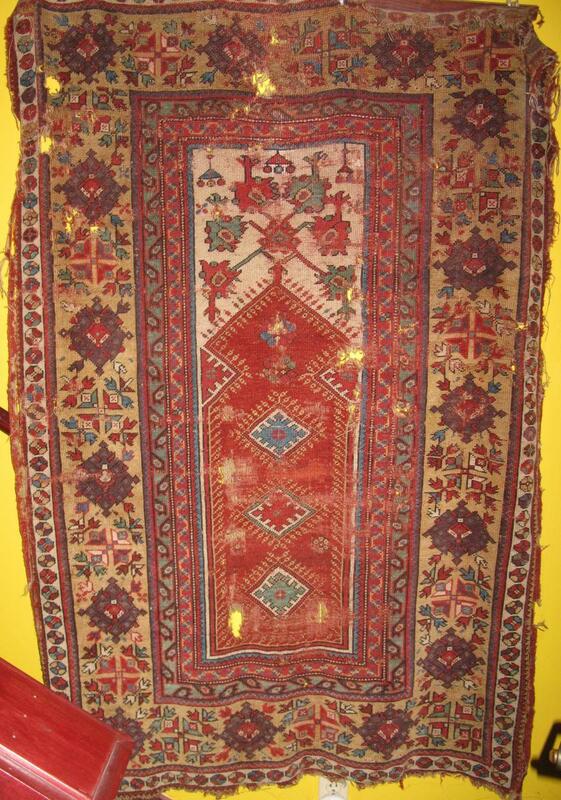 type Transylvanian prayer rug. Circa 1650. 10) Circa 1700 Transylvanian. Melas or Bergama type. One of the more common forms, this piece may be somewhat earlier in the production given the boldness of the drawing. Note particularly the execution of the cartouches, which are quite animate, and the drawing in the vases and the outlining of the field. 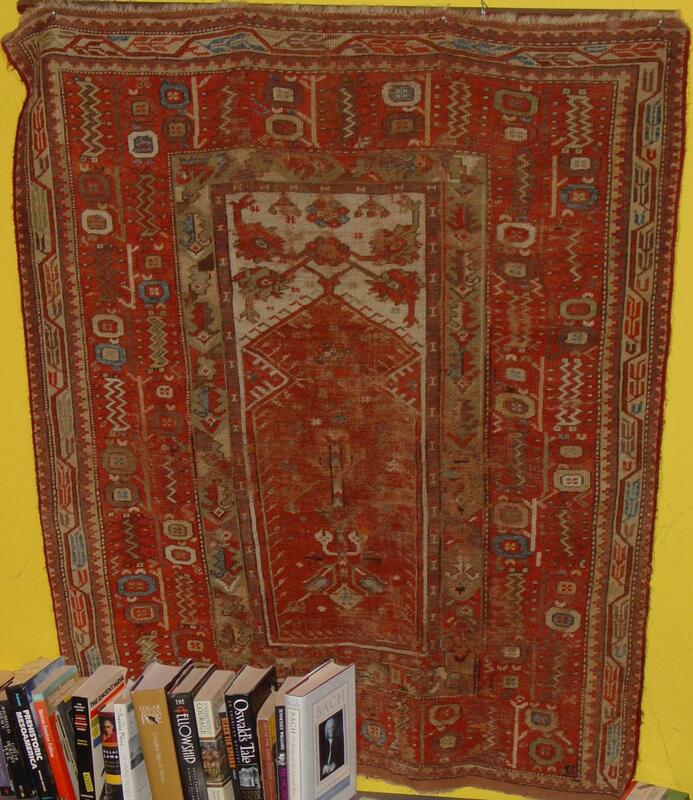 11) Red field prayer rug. Melas, or possibly Kula or Giordes? (Although the background color of the main border, the minor border, and their relative proportional scale would suggest otherwise.) 17th century or early 18th. Lazy lines and a very fine weave. 12) Circa 1700 Transylvanian type Melas? prayer rug. Some might think the spandrels and mihrab are more typically Kula design although the minor borders are more typically Melas. 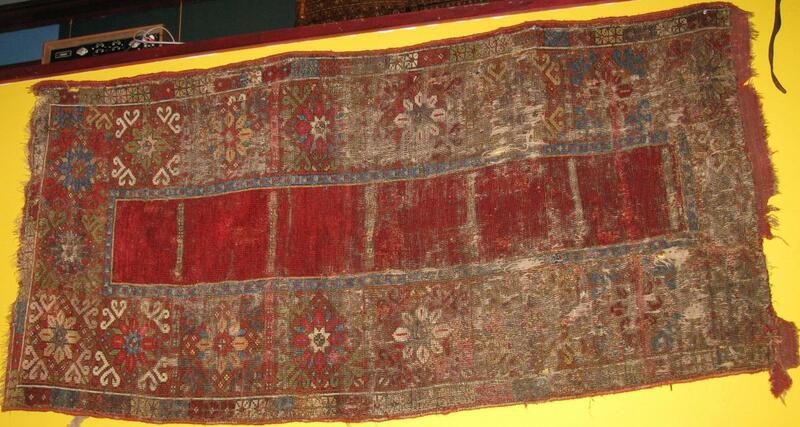 14) Large fragment of a triple niche Transylvanian rug of exceptionally fine weave. Melas, possibly Giordes? or something completely different. I think this piece may be particularly early and is quite refined. 17th century or earlier. 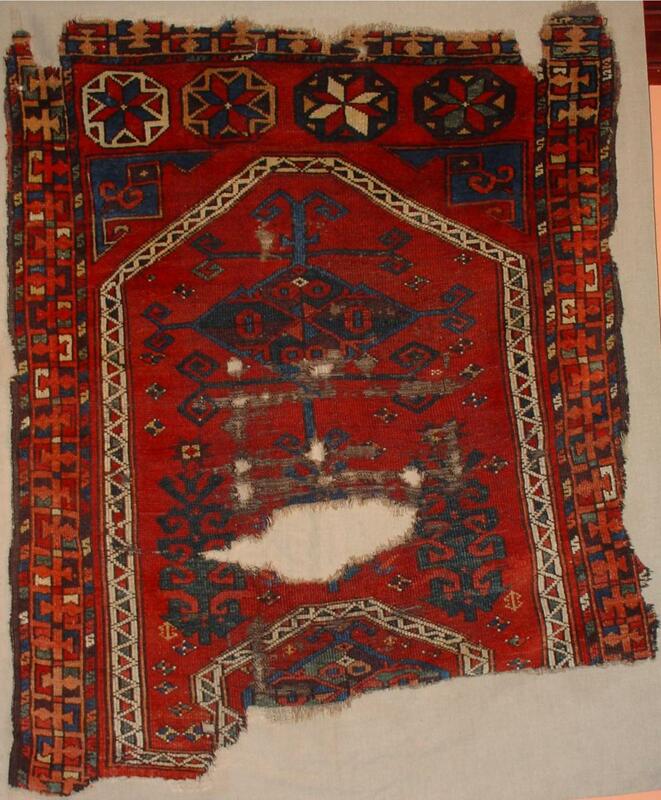 15) Circa 1700 Giordes prayer rug fragment. 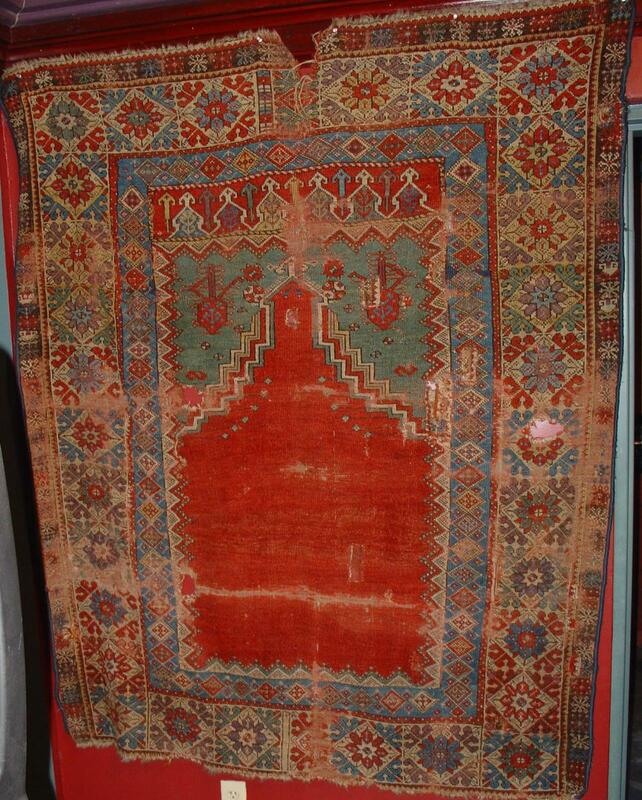 16) Circa 1800 Melas rug. Is the red/orange insert intended to suggest a mihrab? The remarkably wild drawing of this piece speaks for itself. 17) Late 18th century Melas. Exceptionally wide range of color for the type. In light of the accompanying essay, one might consider the layers of design in the mihrab as related to the hierarchical ‘seven heavens’. 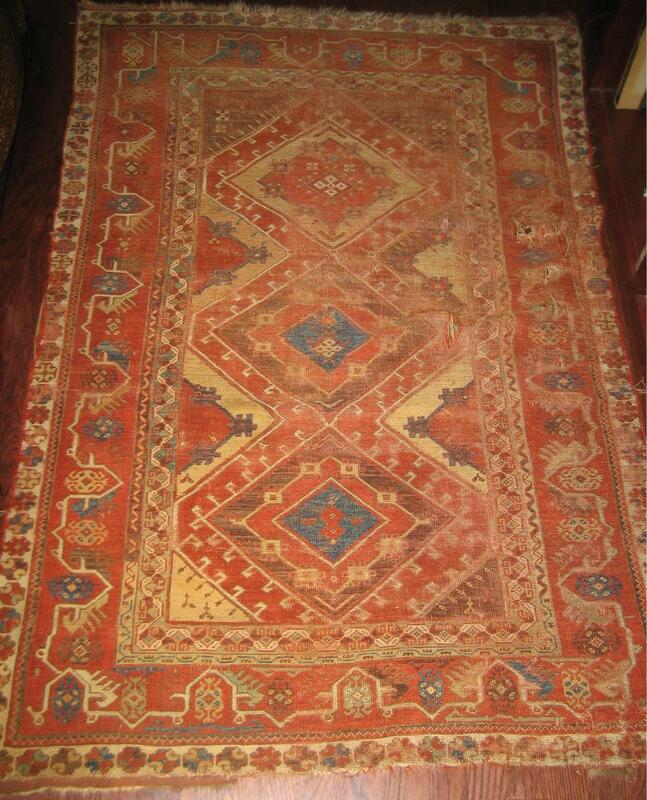 18) Three medallion Melas carpet circa 1800 or earlier. The details of drawing, such as the latch-hooks, suggest an earlier date for this rug than one might anticipate. 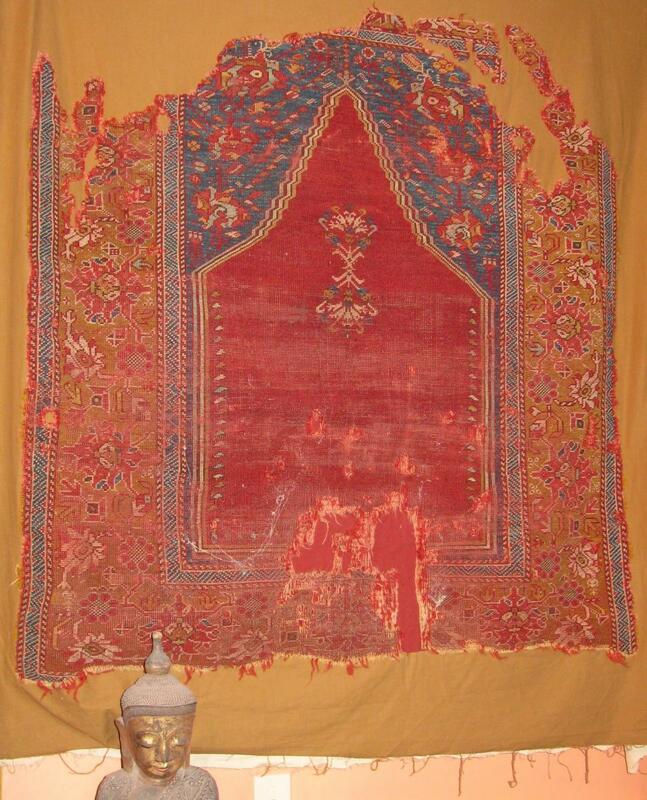 The border system shows many relationships with several types of Melas prayer rugs and the point can be made that it has a distinctly directional sense. 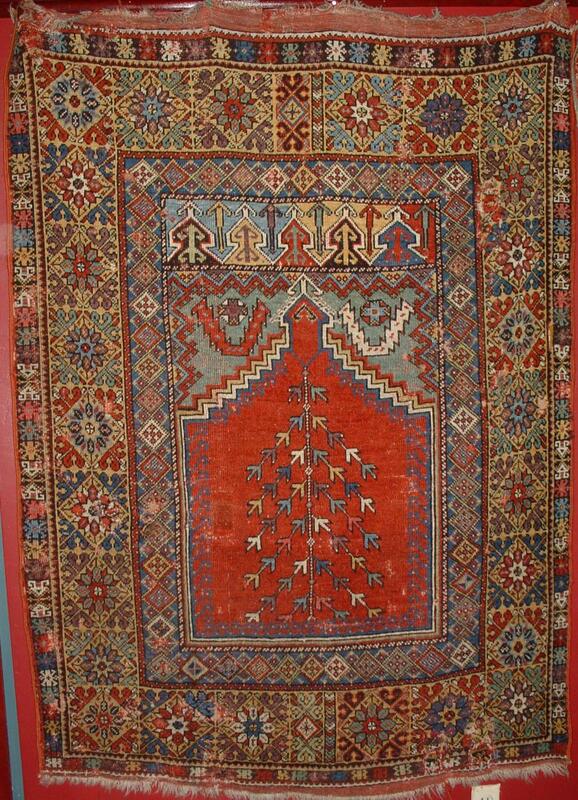 19) In looking at the field of this rug and excluding the main border one might come to the conclusion that it is a Bergama piece, or even Konya, based on the quality of the wool and color palette. 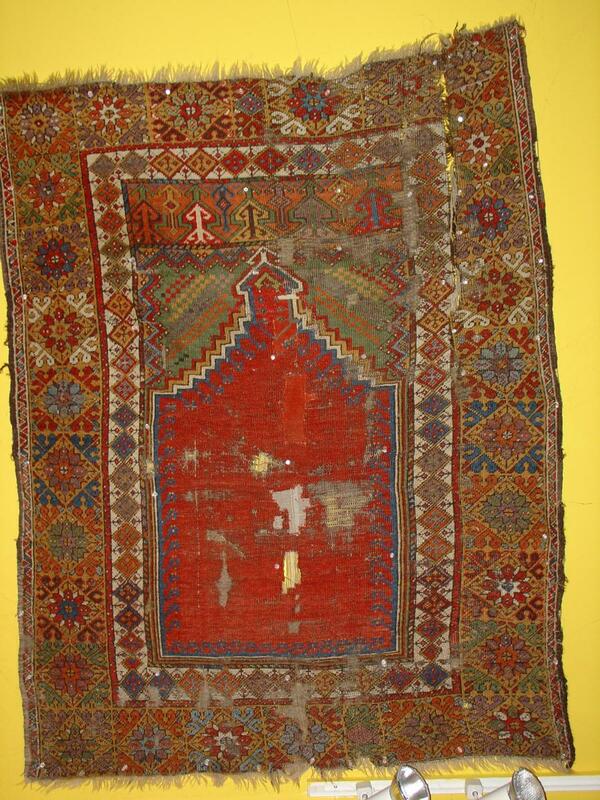 If this can be considered a Melas piece it may help to draw some conclusions about some of the aforementioned prayer rugs in the Transylvanian group. 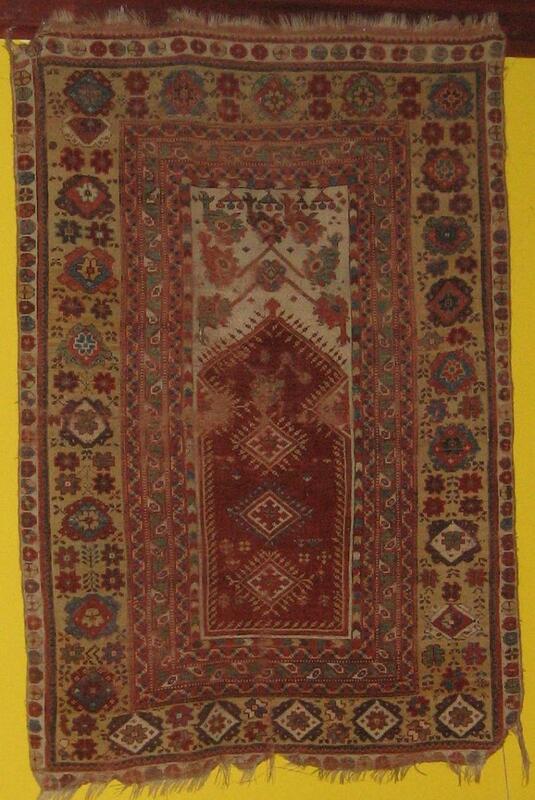 20) Circa 1800 Melas rug with box design. 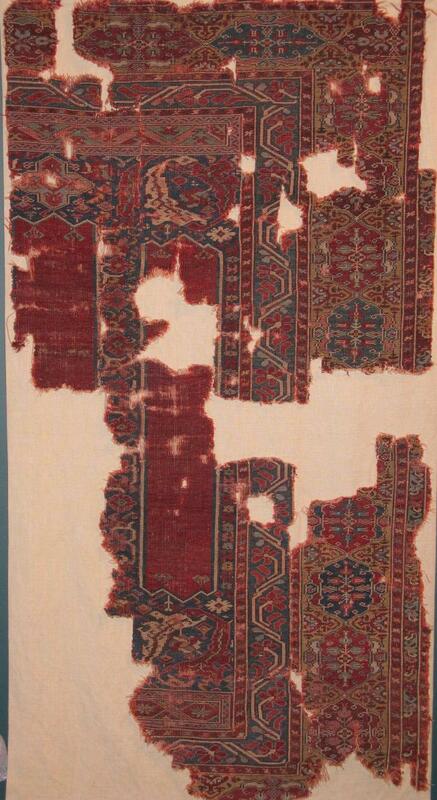 The remarkably archaic arrow-head devices around each box lead one to speculate on the age of this rug and the tradition out of which it arises. 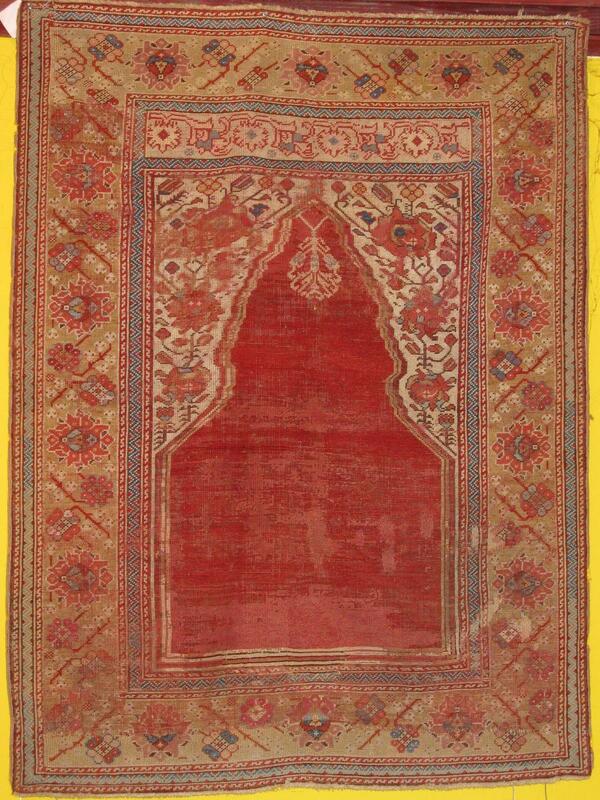 21) Double-niched Melas prayer rug, circa 1800. An incredible hybrid of abstract and natural forms and purely geometric conceptions. 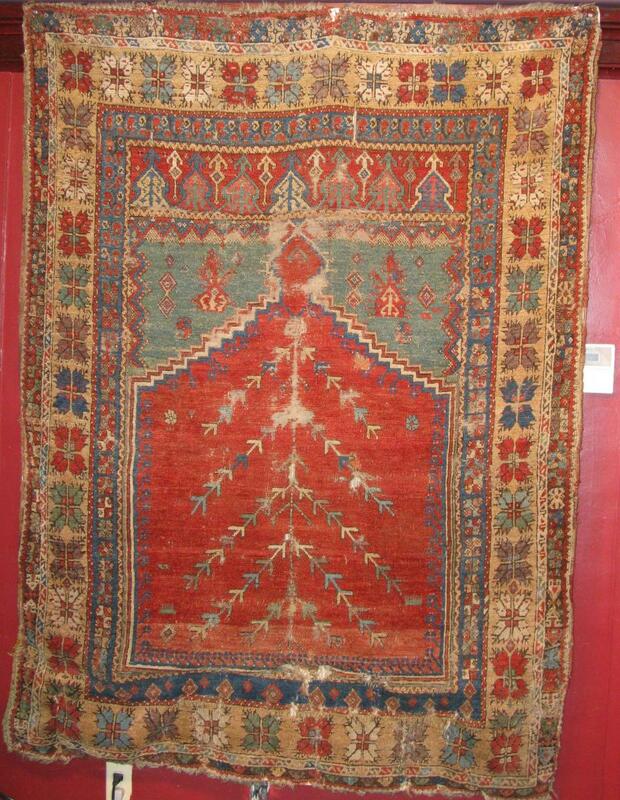 22) Circa 1800 Melas prayer rug with unusual tree-pole device in the field, standard variation of palmettes in the spandrels and powerfully drawn main border the iconography of which is unclear. 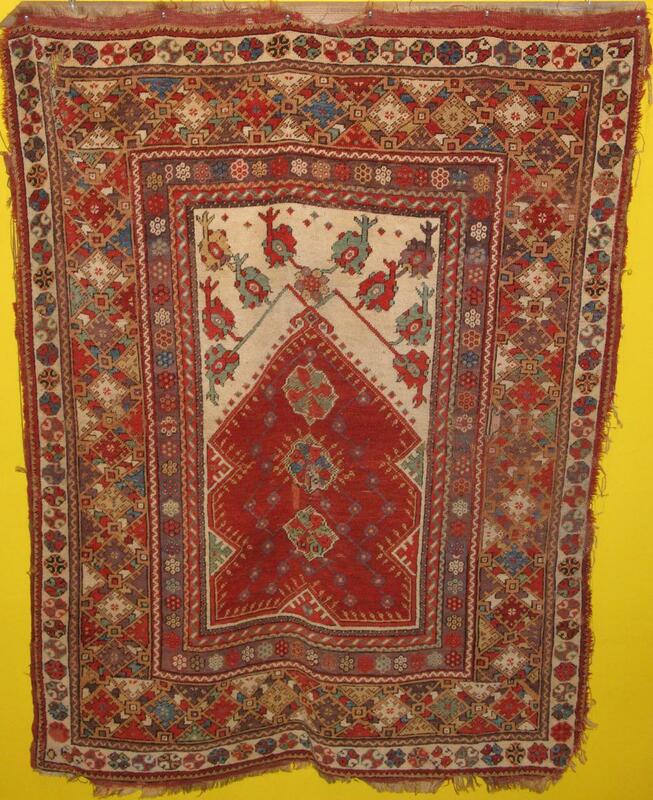 23) Circa 1800 Melas prayer rug. The second minor border in is a standard minor border in Mudjurs. Not only does this rug have wonderful progression of color, it creates an exceptionally strong visual resonance. The freedom of drawing in the yellow main border has great artistry and rhythm. A fascinating study in relative scale. 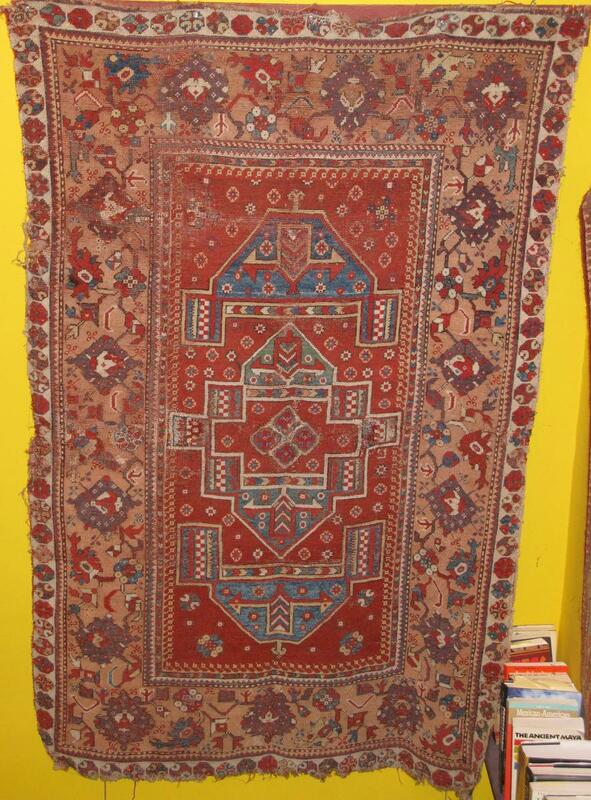 24) Compared to the previous piece this Melas prayer rug presents itself much more simply. The vibratory interplay of the minor borders surrounding the field being less forceful allows the eye to comprehend the irregularly arranged elements in the field without distraction. The comparison of the drawing of the spandrels demonstrates, as does the main border, a greater penchant for regular rhythm and a tendency to define space more geometrically. Compare the sense of flow and the negotiation of corners in the two main borders. 25) This rug appears to have the same layout as no. 22, three ascending tree-like devices in rhombuses, in this case surmounted by two rosettes. The drawing of the palmettes in the spandrels is here realized geometrically creating the sense of another niche. The triangular amulets are of course a surprise. It is the balance of color, drawing and spacial proportion that give this rug an outstanding presence. The spaciousness of the main border and the careful attention to the octofoil devices between the purple palmettes create remarkable reciprocal space. 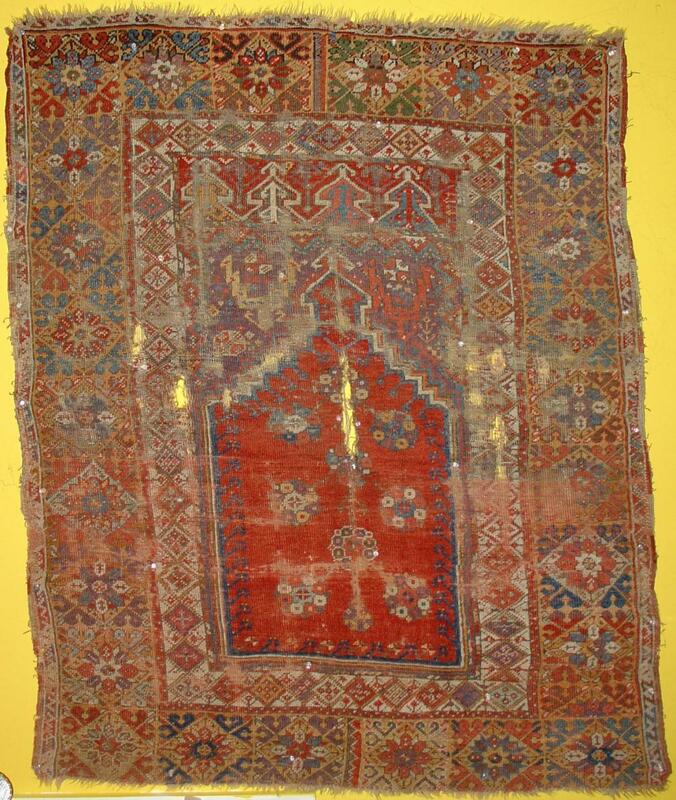 26) Melas prayer rug, late 18thcentury. A close design analogue to the two prior pieces but with an entirely different sense of musicality largely attributable to the relatively small scale of the main border. 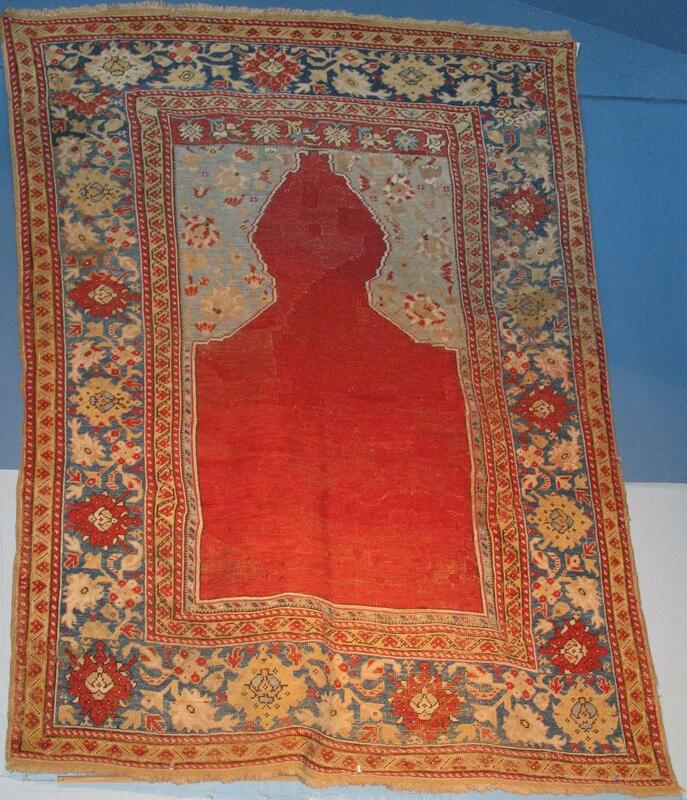 27) Konya / Melas / Mudjur hybrid prayer rug, circa 1800. This geometric border is not often found in Melas rugs and this particular drawing might be more at home in Konya pieces. The balance of space here between the spandrels and the field, which outlines the entire niche, is an unusual feature and may be unique to this rug. Like example 32, the architecture of the floral arch above the niche adds greatly to the rugs dimensionality. We hope our viewer of this image can see the dynamism of the oscillating trellis around the rosettes in the niche. 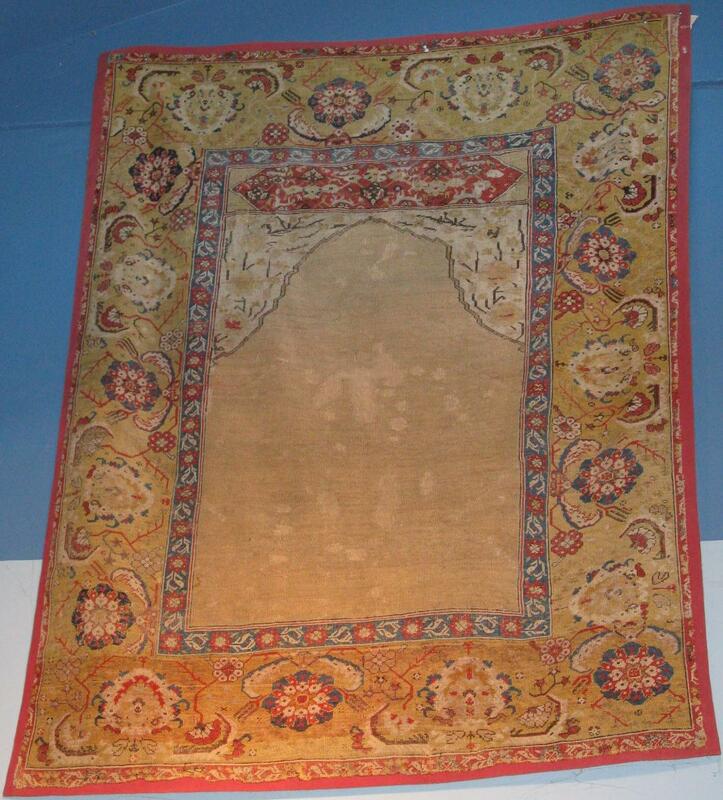 28) The place where this prayer rug was woven is difficult to ascertain. Obruk is one guess but perhaps another place further east in Anatolia like Sivas is more likely. Here we are getting a taste of a tradition we know practically nothing about. 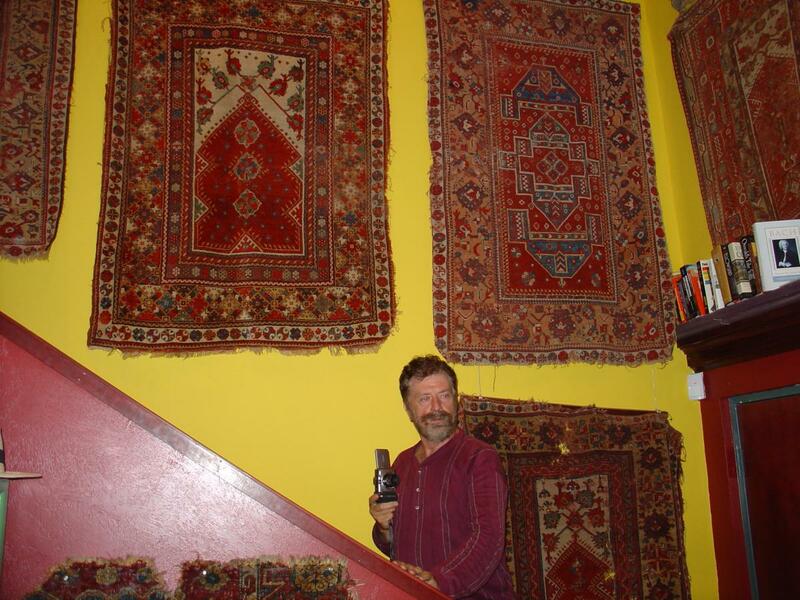 In terms of prayer rug types it is very difficult to find near analogies. 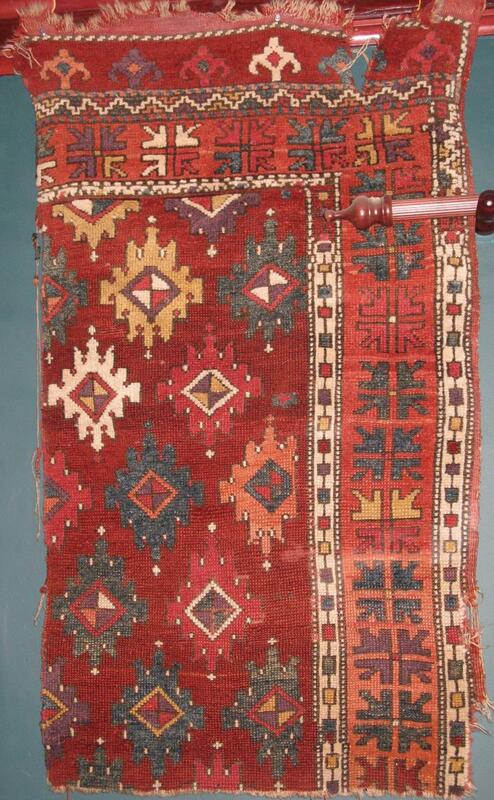 29) A tentatively Karapinar prayer rug with a Bellini key-hole design. In dating this rug we should allow for some wider extremes as we have no cognate. It raises many interesting questions. Could it be from further east in Anatolia? 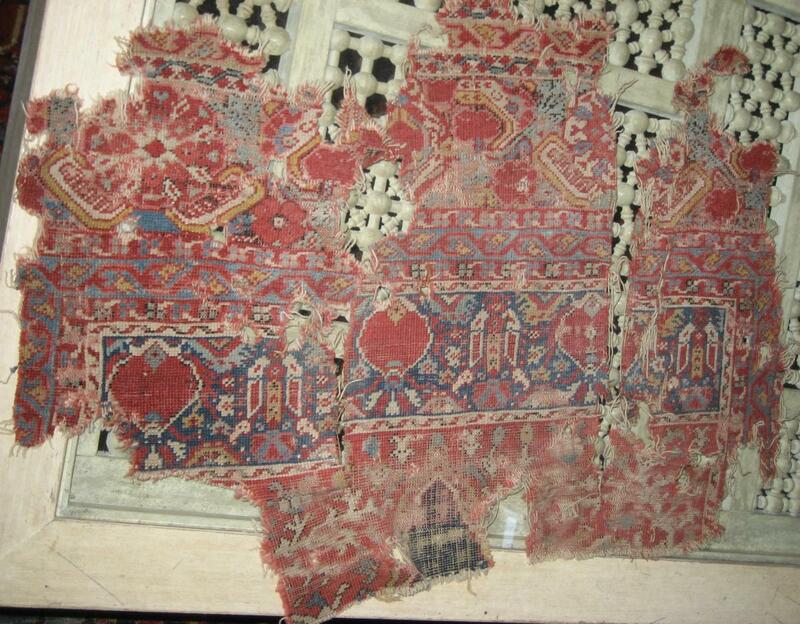 30) Though not a prayer rug, because of similarities in weave, color and drawing to the previous example, and because it closely resembles a piece in the Vakiflar attributed to the 15th century (Balpinar and Hirsch p. 189), this fragment is offered for comparison. 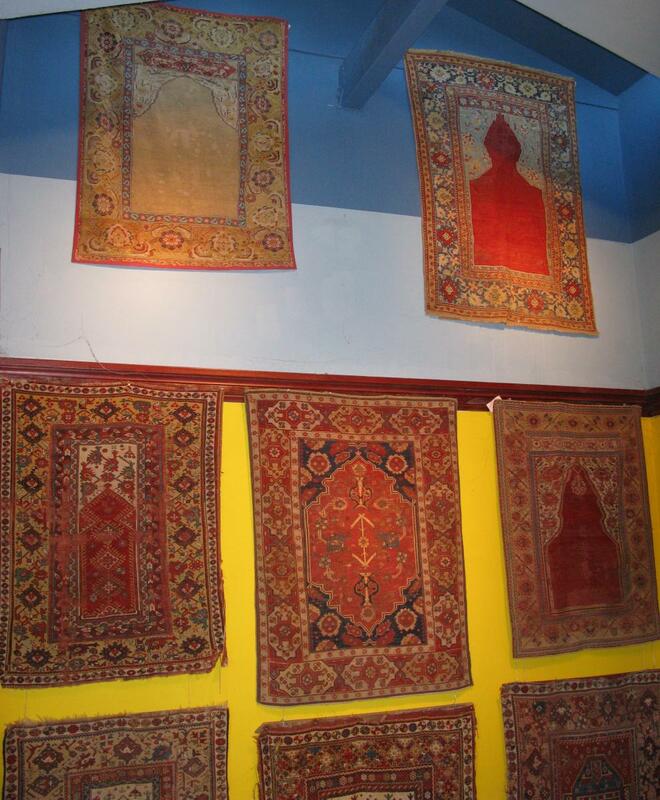 groups of Turkish rugs represented. submitted be NOT for sale and of appropriate age. Rugrabbit and Jim Dixon would like to extend special thanks to Dr. Gary Gartenberg for his help in making this exhibition possible.